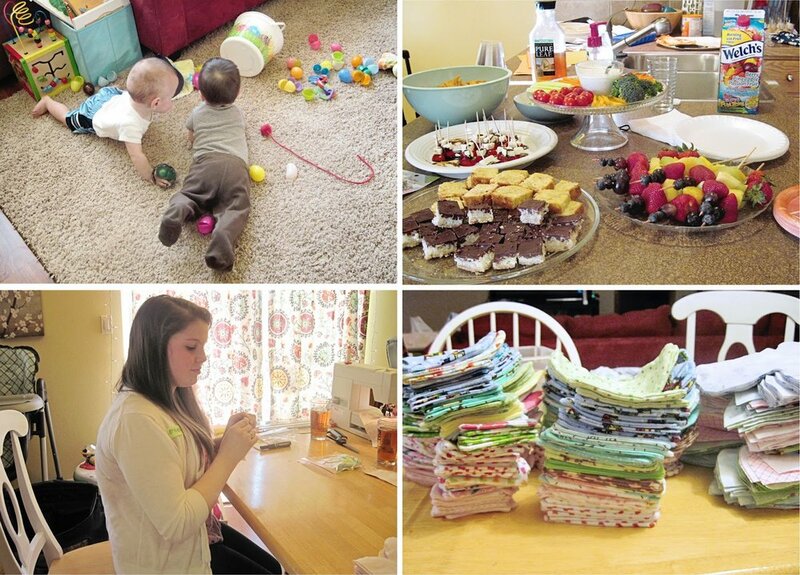 Teeny Tears enthusiast Jana has been up to her diapering adventures again! Jana invited friends and family to participate in a diaper night; a great time was had by all! While participating in a March for Dimes event, Jana delivered a donation of diapers to the Labor and Delivery unit at the University of Washington Medical Center in Seattle. Surviving twin and miracle micro-preemie Cohen spent long months in the University of Washingon NICU. These 80 diapers (40 sets) were donated in memory of Cohen's twin brother, Carter Garen Kimmel. Another 20 diapers were donated to Now I Lay Me Down To Sleep of Everson, WA. 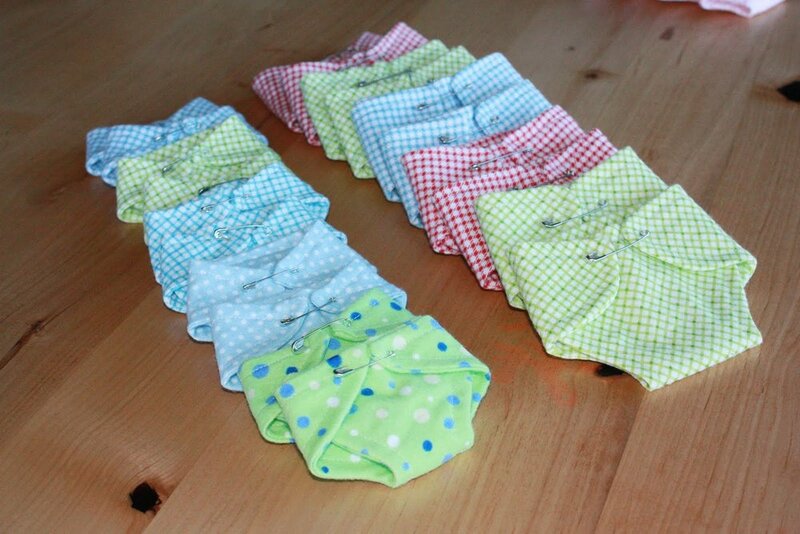 She packaged them in a creative way, pinning the sets together with a straight pin and slipping the distribution cards inside the diapers. You can read more about Carter and Cohen here. You can see slide shows of these special brothers by clicking here. 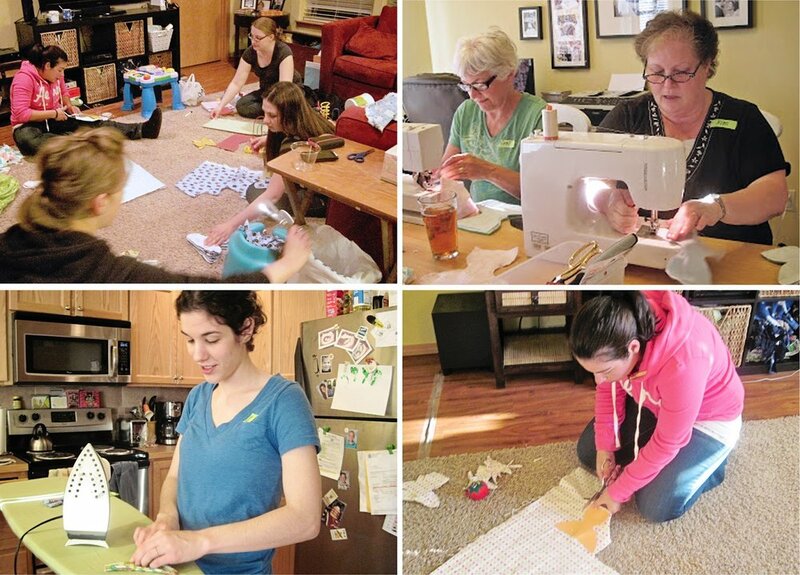 Jana's mom Carol has joined the Teeny Tears team behind the scenes as our sewing resource expert and dedicated diaper cheerleader. She has a lot of experience with fabrics, machines, and stitchery and has boundless enthusiasm and love for the tiny angels we serve. We are very grateful to have her years of sewing experience and mama-wisdom to rely upon for our project! I think this picture of Carol on a recent cabin vacation really illustrates her energy and personality! Carol also makes beautiful, tiny angel wraps to go along with the diaper deliveries. Instructions to be posted soon! Jana's family and friends love the angel families of the Great Northwest! There is a beautiful organization called the Now I Lay Me Down To Sleep Foundation. I knew from the beginning that I wanted to give diapers to the volunteer bereavement photographers who participate in this touching service project. We gave our first full set of 40 diapers to the Salt Lake chapter of NILMDTS! 20 little boy diapers for 10 little boy angels and 20 little girl diapers for 10 little angel girl angels.